In the wake of French Ecology Minister Nicolas Hulot’s resignation a couple of weeks ago, the country has been virtually obsessed with environmental issues. Not that the topic is pointless, despite what the ruling US administration claims, but the degree and angle with which it is being tackled have ceased to answer to reason and, instead, rely on emotional reactions to a very real and very global problem. 1) All current climate-related messages are incredibly alarming: in short, the planet is dying quick and/or we are, and we don’t do nearly enough to save or merely protect it. Their conclusions tend to be rather macabre: the risk of mankind greatly suffering and/or disappearing altogether is very real. Such broadly shared positions then give way to all sorts of pessimistic and/or nihilistic messages: we are doomed, or very close to it. Although climate change as well as its effects on the environment and mankind are indeed deemed very real by (real) scientists, this doesn’t mean that the game is over yet, far from it: if you shut out the emotional background noise for a minute, you will notice that several voices are sharing very different, somewhat more hopeful messages. Such is the case with Al Gore, who famously made the topic front and center years ago: in a sadly less notorious sequel to his brilliant 2006 documentary, Gore shared a hopeful update in 2016, highlighting stronger than expected dynamics working to counteract the effects of global warming. These dynamics are - and should be - largely coming from the private sector: simply put, it is becoming interesting to work towards improving the environment. And nothing beats business when it comes to solving a major, time-sensitive issue. Greed, for lack of a better word, is good. 2) There is an increasingly identifiable ideology underlying many of said current climate protests, with increasingly questionable effects. 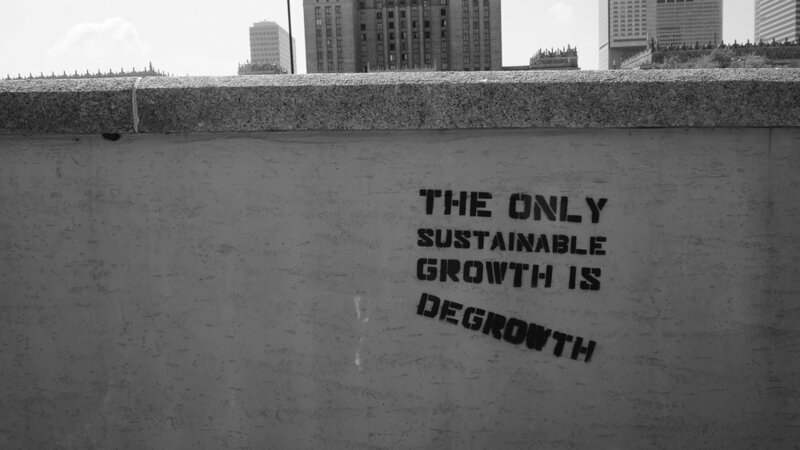 That ideology, especially in Europe but not only, is focused on the concept of degrowth as a long term goal: humanity has gone too far, grown too much, produced too many things and now needs to scale back if it wants to survive. In other words, and directly contradicting Gore’s analysis, the answer would be doing less rather than more. This is the part where ideology, i.e. irrational thought, comes in: this thesis is not based on data and facts, but rather on a subjective condemnation of the modern capitalistic and consumeristic lifestyle. Doing less won’t solve the issue, it may at best slow down the deterioration. The answer, as has been the case throughout history and as highlighted by economist Joseph Schumpeter a century ago, is the exact opposite: innovation, new energy sources and more efficient tools will get us out of the current dilemma, not going back to the ice age. Why? Because only innovation can trigger new and better ways to harvest solar energy, create more sustainable cities and gradually clean up the atmosphere (which we messed up in the first place: such is the principle of innovation cycles). Furthermore and not quite surprisingly, degrowth theories stem mostly from Western countries, with already fully developed economies that have gone through the entire industrial revolution cycle: try and ask China or India to slow down now and see their response! In essence, this ideology is xenophobic insofar as it ignores the context and objectives of emerging countries’ populations, whose main focus today is improving their way of life towards, ironically, a Western ideal. Denying them the right to grow is not only logically wrong, it is also morally reprehensible. The final noteworthy aspect of this whole debate is - it’s all taken place before. In the 18th and 19th centuries, precisely when the first industrial revolution was soaring, some already claimed then that we had gone too far, that we were risking the fate of mankind, that we would never be able to feed our future children. Economist Thomas Robert Malthus is perhaps the most famous proponent of that thesis, to the point of giving it his name: his belief was that we should decrease worldwide population by adopting drastic antinatalist measures if we were to survive as a species. Guess what happened: we found new ways to produce more food. The problem was solved through innovation rather than senselessly attempting to infringe on people’s most basic freedoms. Let us not make a mistake here: the problem with global warming is very real. But it is not by attempting to go back in time that we will solve it, quite the opposite: we need to go further, innovate more, find out new ways to solve current issues. This is how humanity has saved itself time and again. It’s no different today. This Monday was France's proper back to school day, i.e. when most people rediscover their desk (and realize they forgot their computer password) after their month-long summer vacation on the beach (myself included, to be absolutely honest). And that's not counting teachers: they get 3 times that. Aren't you sad you're not living in France right now? However, some people just don't like school all that much. Such is the case with France's now former Minister for the Ecology (exact title: Minister of ecological and solidary transition, to make things more pompous and less straightforward) Nicolas Hulot: he lasted just that one day... And he quit without warning, too: yesterday morning, he went on a morning radio show and announced, on the air, that he was out without having first notified his boss, the French Prime Minister, or his boss's boss, aka France's (late) answer to Obama - President Macron. That's like a kid not showing up to class the next morning with no explanation or doctor's note or death in the family. That's Nicolas Hulot for you: he's the real OG (aka Organic Green). The reason he said he was quitting after just over a year on the job was - and I paraphrase - that it was hard. I seem to recall the (self-appointed) leader of the world once using the same argument about leading said free world. I guess great minds... In Hulot's defence, though, he was merely referring to leading a country's (that is not the greatest country in the world either) efforts to combat climate change. Sounds pretty easy to me. The kicker of the story is this: Hulot, concluding that trying to move things along while in government is too hard, prefers going back to civilian life, where his voice may be heard louder through his foundation whose aim is to raise awareness on environmental issues. My question is this: how is running a (rather discreet) foundation more effective than being in government to push reforms? Would heckling Macron on Twitter actually be more effective than being part of his cabinet? Do his loud speakers go to 11? In truth, the more likely explanation is quite prosaic: Hulot is running away because he's come to realized that politics are harder than hosting a TV show (his previous job: see the parallels here? ), and that there was an increasing chance that his track record would look pretty light at the (expected) end of his mandate. It's always easier to skip the exam and claim it was rigged than to take it and fail.